Home Fab Lab Connect Fab Replication Grants from Fab Lab Connect – Ending Soon! 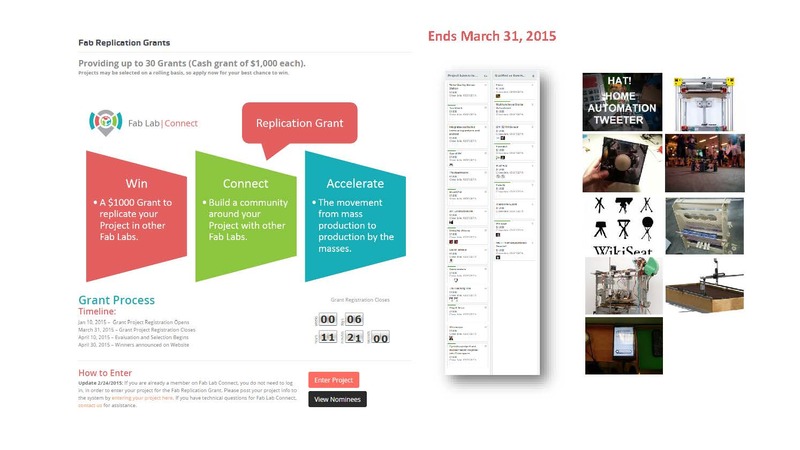 Fab Replication Grants from Fab Lab Connect – Ending Soon! Fab Lab Connect is still accepting submissions for our Fab Replication Grant. Winners will get a grant of $1,000 and support to replicate their projects in a Fab Lab. There are 30 grants available. The deadline is ending soon! Be sure to enter here by March 31, 2015. You’ll need a working prototype that you’re able to replicate in a Fab Lab, along with a Bill of Materials and documentation on your project. How is your project replicated? You’ll get to experience a replication process through the MIT Media Lab Construction approach: hands-on and project-based learning with a supportive team. This experience will also prepare you for further product development, market access, and new applications. Visit our Grants page for more information or check out the nominees so far! If you are representing a Fab Lab and want to offer your facility for project replication, check out this page.